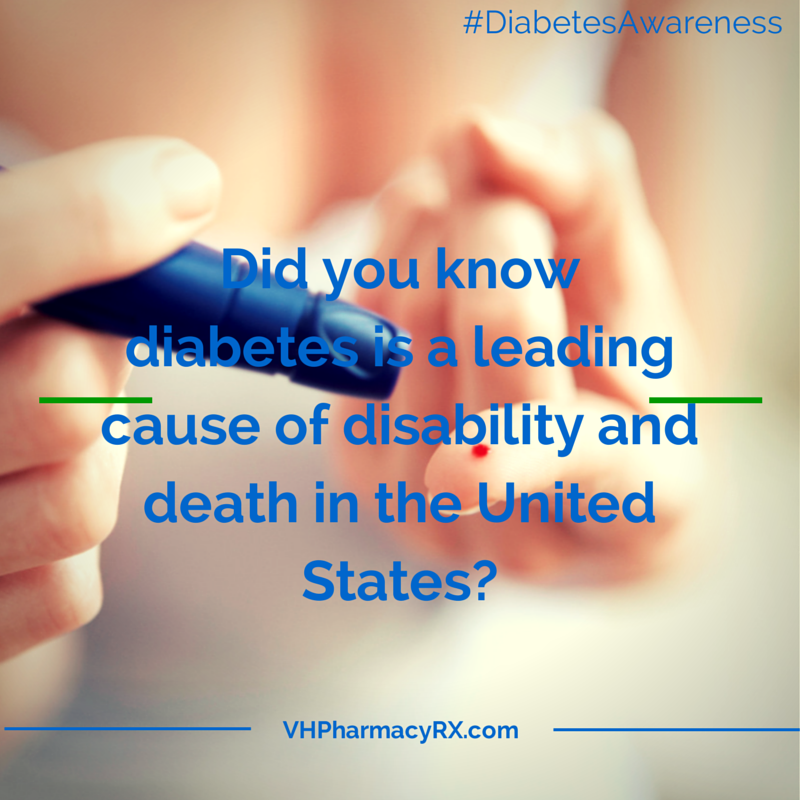 Did you know diabetes is a leading cause of disability and death in the United States? Surprising, I know. But if left untreated and uncontrolled, diabetes can cause blindness, nerve damage, kidney disease and other major health problems. This month is National Diabetes Awareness Month, which makes it the perfect time to focus on this chronic medical condition. In order to understand the seriousness of diabetes, we need to know exactly what it is. Diabetes is a disease in which blood glucose levels are above normal. Most of the food we eat is turned into glucose, or sugar, for our bodies to use as energy. The pancreas, an organ that lies near the stomach, makes a hormone called insulin to help glucose enter our body’s cells. When you have diabetes, your body either doesn’t make enough insulin or can’t use its own insulin as well as it should. This causes sugar to build up in your blood. A person with pre-diabetes has a blood sugar level higher than normal, but not high enough yet for a diagnosis of diabetes. He/She is at a higher risk for developing type 2 diabetes and other serious health problems, including heart disease and/or a stroke. -Having a parent, brother, or sister with diabetes increases your chances of getting diabetes. -If you’re not physically active. -If you’re overweight, especially around your waist. Not everyone with type 2 diabetes is overweight, but extra pounds make it more likely, especially belly fat. -You have high blood pressure. -Your “good” cholesterol level is low. It’s too low if it’s less than 35 mg/dL (milligrams per deciliter). -Your triglyceride level is high. It’s too high if it’s over 250 mg/dL. -If you’re a woman and had gestational diabetes during pregnancy or a baby weighing over 9 pounds at birth. -You’re a woman who has PCOS (polycystic ovary syndrome). -You’re 45 years old or older. Although diabetes is not a normal part of aging, the chance of getting type 2 diabetes rises with age. -You are Hispanic, African American, Native American, or Asian American. Diabetes is more common among these ethnic groups. Although the exact reason is not fully understood, the medical community strongly believes it has much to do with access to health care and cultural exercise and eating habits. One in 12 Americans has diabetes and experts predict that number could be closer to one in three by 2050. But it’s not all grim news. Research shows modest weight loss and increased physical activity can help prevent or delay type 2 diabetes by as much as 58% in people with pre-diabetes. And, the Centers for Disease Control want to help. Through their lifestyle change program – National Diabetes Prevention Program – individuals at risk can adopt the healthy habits needed to prevent type 2 diabetes. You can even find a program in your community.